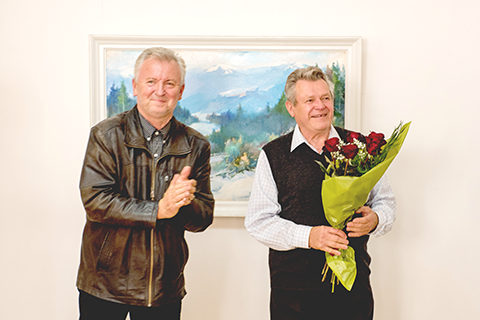 On 29 September 2017, in the premises of the "Uzhhorod" gallery it was opened a personal jubilee exhibition of Transcarpathian artist, who was born in Ivano – Frankivsk region, Ivan Romaniuk. The beauty of Transcarpathia gives space for creativity, thus in the works of Ivan Romaniuk one can see the nature of Perechyn, Turiia Poliana villages, but most of all he likes going to Syniak, Kolochava, Synevyrska Poliana villages. In addition to landscapes, the exhibition also includes still lifes, and the artist created portraits as well. "I painted portraits, but to each his own – I prefer landscapes. I like working on still life, especially – to depict flowers, but I always return to the landscape. I really enjoy it." The exhibition of works in the gallery "Uzhhorod" will continue until 11 October 2017.